Hello card making friends. 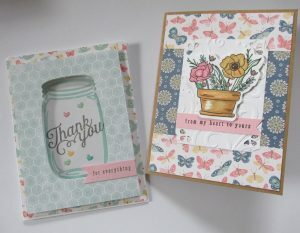 Today I wanted to share two cards that I created with the August Simon Says Stamp Kit. 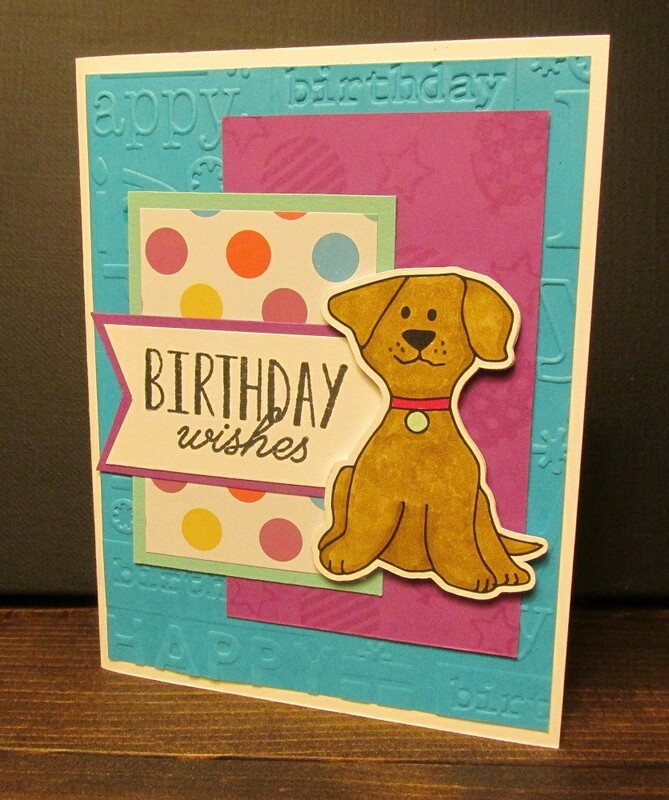 I wanted to make a very special card for my sister-in-law because she took care of our dog while we were on vacation. When I finished up these two cards, I wasn’t sure which one I was going to send! This card was a little on the tricky side. 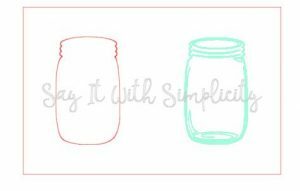 I knew that I wanted to use the mason jar SVG that I created as well as cut the components on my Silhouette Cameo. I also wanted to create a window using acetate to make it look a little more like a jar. 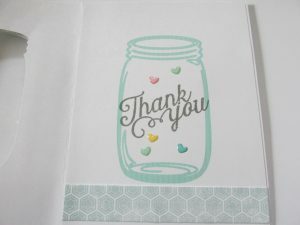 First I created a card base in the Silhouette Studio program, and was able to center an outline of my mason jar on the front side of the card. I also did a print and cut on the other side of the card. It looked something like this when it was ready to cut. Next I created two front panels with the jar outline knocked out. One was just slightly smaller than the card base. The other was 5 x 3.75 inches. I cut both of these out of some of the patterned paper from the kit. I layered my first panel over the card base, then glued a piece of acetate over the top. Next I used some foam tape under the top layer and adhered it to the top of the card. 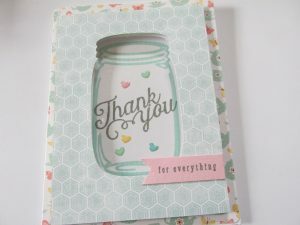 All the knocked out layers are now one front window and the jar is printed on the inside of the card. 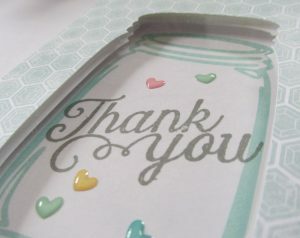 I used the Thank You stamp from the kit and stamped it on the jar, inside the card. Using some of the left over patterned paper, I put a strip on the inside of the card. There were some tiny Doodlebug Designs hearts and I adhered a few for some color. All in all, I like how this card turned out. 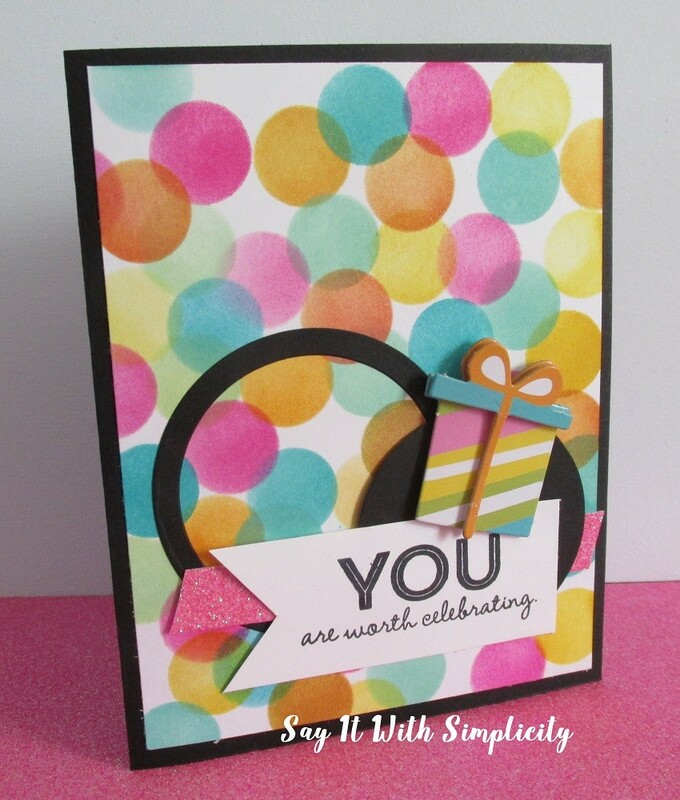 I added a little pink banner, on the front of the card using the “for everything” sentiment from the stamp set. This card was a little less fussy. I sort of started without any real idea, but it came together in the end. 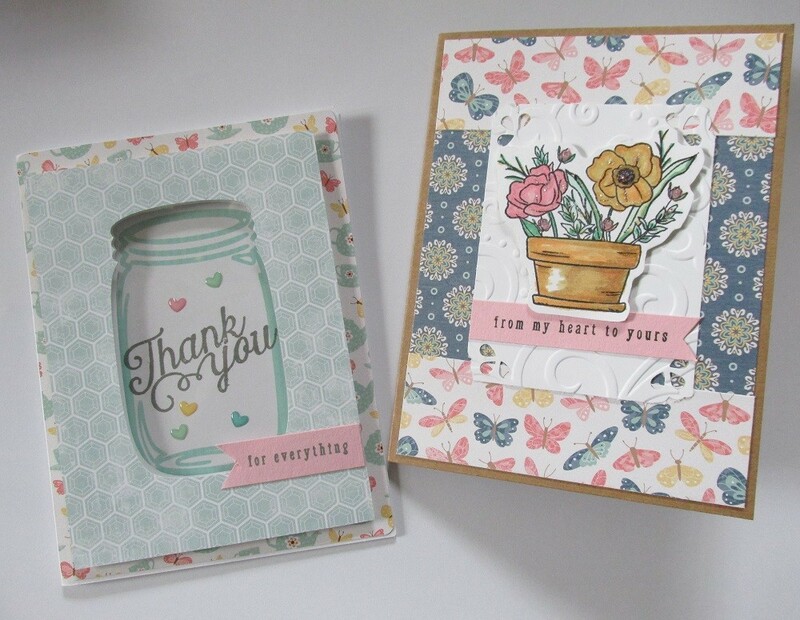 Doodlebug Designs Tiny Hearts from the kit. 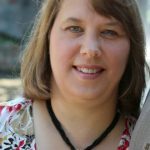 I’m sure many of you, reading this, are already familiar to card making. You can see how I put the elements together to make the card. 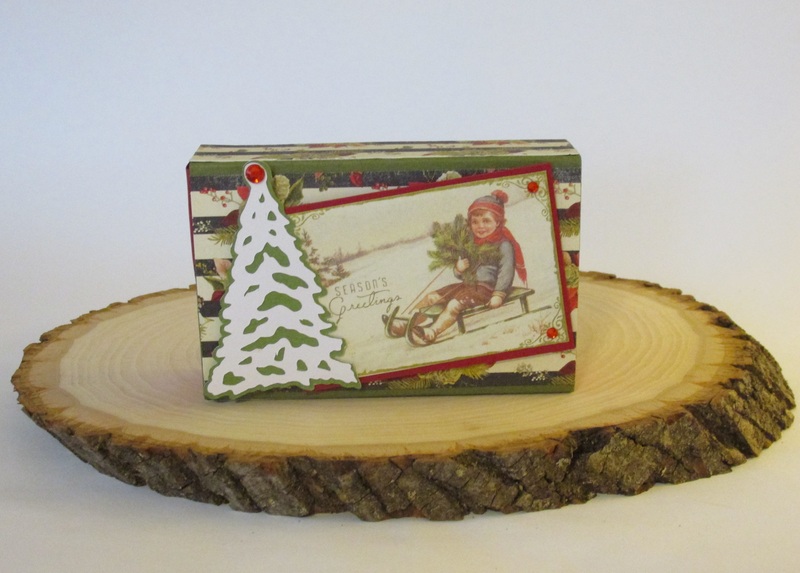 The top and bottom patterned paper strips are 1 1/4 x 4 inches. I created a white panel for the front 2 3/4 x 3 1/2 inches and used the corner punch. I decided it needed some texture. So I ran it through the Cuttlebug with a Darice embossing folder. I was trying to keep the depth of this card a little bit minimal. However, if I had to do it over I might have used a little foam tape for that front panel. 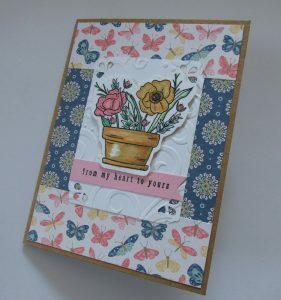 When I did the stamping for this card, I knew I wanted to cut out flower pot and flowers image. 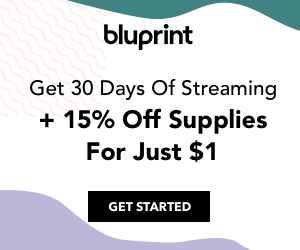 A die to cut it out would be great. Instead I laid my stamp face down on my card stock and traced lightly around the edge with a pencil. This gave me a cut line to cut with my scissors. Then I stamped my image. Little by little I’ve been collecting new Spectrum Noir Markers when I have a Joann coupon. I don’t have many, but I was able to pick out some that would work for coloring. In the end I think they really worked with the patterned paper. At first I wasn’t real happy with the gold on the flower, but I applied the Diamond Stickles to give it some shine and it really turned out nice. I also used the Bubble Gum Blush Nuvo drops on the tiny pink roses on the card. The extra shine and dimension was really what the image needed. I stamped “from my heart to yours” on the pink banner and also decorated the inside of the card with a white panel using my corner punch. 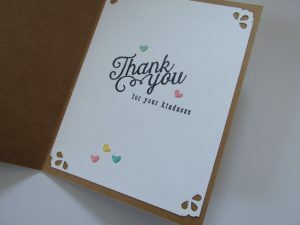 I also stamped “Thank you” and “for your kindness” on the inside. The little hearts are so adorable and so I used a few on the inside of the card as well. There you have it. I got the Simon Says Stamp August kit, right after I got back from vacation. The following week, I was doing some work with our local Master Gardener group and didn’t have a chance to work on cards. I was really excited to get these done so I could send out some Thank You’s. Thanks so much for stopping by today. We’ll see you next time.